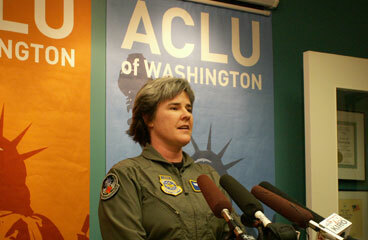 “Dynamic officer” … “A vital team player” …”Exceptional flight nurse” … “Excellent role model” … “Always ready to support the mission.” ACLU of Washington Legal Director Sarah Dunne led off her opening argument with these words from Air Force performance reviews for Major Margaret Witt at different times. “She does not cause a morale problem, and in fact her service and leadership builds and sustains unit cohesion,” summarized Dunne. She went on to outline the evidence the ACLU will present during the seven-day trial to build the case that Maj. Witt should be reinstated to the 446th Aeromedical Evacuation Squadron. Former and current unit members will testify they didn’t care and currently don’t care about Major Witt’s sexual orientation. And that it had no impact on the work and mission of the unit. They will testify to her excellent nursing abilities and exceptional leadership. Further, unit members will testify that the 446th for over 30 years had a culture of acceptance of gay and lesbian servicemembers. That the unit had a history of widely suspected or known gays and lesbians serving, and their sexual orientation – or perceived orientation – made no impact on their service. Gay and lesbian servicemembers from all three branches of the U.S. military who have served openly will testify that serving openly actually had a positive effect on unit cohesion. It increased the level of trust with fellow servicemembers. In addition, academic experts will testify about the impacts of allowing gays and lesbians to serve openly in the military. And three members of the 446th with decades of experience in major fire departments will discuss their experience serving with gay and lesbian firefighters. In short, the evidence will show that Major Witt’s sexual orientation was a non-issue within her unit when she was suspended in 2004 under “Don’t Ask, Don’t’ Tell” and remains a non-issue today. For its part, the government – in the person of Dept. of Justice attorney Peter Phipps, representing the Air Force – defended the military’s actions against Witt, pointing out that “Don’t Ask, Don’t’ Tell” is supported by congressional and military regulations. Its intent is to fulfill the important government interest of maintaining unit cohesion and morale. “This has to be applied the same way everywhere,” he said. “There can’t be special exceptions made without creating problems.” Phipps also said that Major Witt had “compromised her integrity and ability to lead” with a relationship with a married woman (i.e., her long-time partner who was married when they first became involved), and two other relationships with female Air Force officers.